If a pet's nails are allowed to grow, they can split, break or bleed, causing soreness or infection in your pet’s feet and toes. Long nails can get caught and tear, or grow so long that they can curl backwards into a spiral shape that can make walking very painful for dogs (it's like walking in shoes that are too small).Cats are able to retract their claws so this is less common for them, however,cats do still need to have their nails regularly clipped (especially if they don't get much natural wear and tear). Uncut nails may curl so far that they pierce the paw pad, leading to infection and debilitating pain. Nails should be inspected and/or trimmed on at least a monthly basis. If not, the quick tends to grow out with the nail, making it nearly impossible to cut properly. It is very important not to cut the quick of a nail as this is rich in nerve endings and very painful for the pet. If you are unsure what to do what your pet's nails, make an appointment today to have your pet’s nails checked. 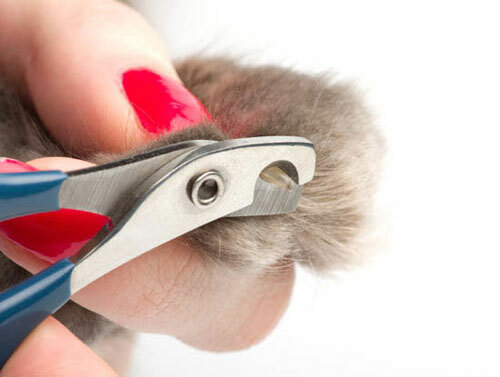 We can trim your pet's nails or we can also teach you how to do it if you would prefer to cut them yourself.